The idea for Hope Tank was born during a volatile time for Erika Righter. After moving from Boston in 2006, Erika worked in social justice and emergency care around Colorado until the organization she was working with closed down. Once she was without a job, she began toying with the idea of creating a public space for local artists and wanted to incorporate her nonprofit ideals into the concept. “As far as products go most find me, but I am always trying to cultivate a product base that represents the population of people who shop with us, such as indigenous artists and people of color and art that represents people with disabilities.” Erika said. Hope Tank is located at 64 Broadway. The store sells novelty items and other works made by artists from Colorado and nonprofit partners, such as Access gallery and Denver VOICE. Available products at the store range from body care to artwork to gag gifts. The small staff has more obligations than focusing only on retail because they also act as liaisons between the customers and the nonprofits to identify and engage what message is relayed. 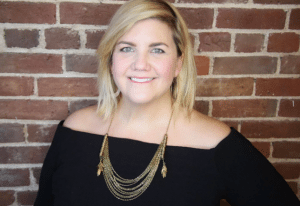 With roughly 40,000 customers coming in to the store annually, Erika hopes to take advantage of each opportunity in the retail exchange to bring awareness to the nonprofit partner and encourage people to be advocates on social media. Erika has a special place in her heart for her neighbors on South Broadway. This location faces the same pressures most up and coming areas do, rising rents and operation costs. However, Erika is confident that South Broadway is an important location for her due to the community of support that surrounds Hope Tank. Currently, there are 23 women owned businesses within five blocks of her store. Stores such as Mutiny Information Café and Rosehouse, do collaborations with Hope Tank on podcasts, crafts and brainstorming new routes to engage the community while highlighting voices that do not always have a platform. “I think that the climate in our country in general has made what I do more accessible to people. 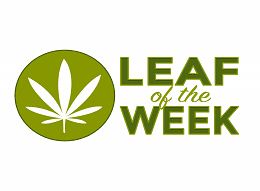 People are looking for things that provide some sense of control with what’s happening and want their money to be spent in ways that are more thoughtful.” Erika said. Erika hopes that her store and community partners open the door for people in Denver to experience a more inclusive and representative scope of the city. “We try to have a good mix of what all of Denver looks more like whether beer fan, feminist, queer or all of the above, we have something for you.” Erika said. This summer, Hope Tank will be involved in a handful of events including store gatherings and partnerships at the Grandoozy festival. Erika is trying to highlight summer community events via the Hope Tank social media pages and website. The website also hosts the Inclusive Business Directory, which is a spreadsheet featuring local businesses ran by women, people of color, community activists and more. 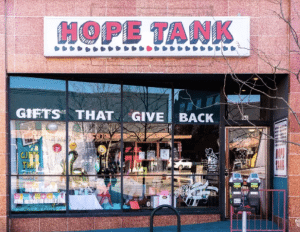 To get further information about getting involved in the Denver community or just purchasing a gift that gives back, visit Erika at the Hope Tank store or on the website at http://hopetank.org/ .